Psalms 27:14 - Wait on the LORD: be of good courage, and He shall strengthen your heart: wait, I say, on the LORD. (The word "courage" means "be encouraged".) Our world today holds in it trouble and fear; but we don't have to take on these "troubles"; for if we allow the Lord to take hold of our hearts, he will fill our heart with His Joy, and His Peace. Let Him guide you to His Love and Truth. Welcome to my blog, Grateful Heart Greetings! 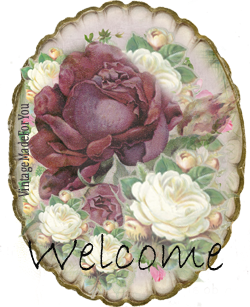 A little place that I will share my creations made with my own images & digital stamps. :) You may find my images at my Etsy Shop, click Here! I also have a Facebook Group, that you are welcome to join. Also, you'll find in my blog, "Blessings" to share, from God's word. You're invited to come and visit....stay as long as you like! I decided to make an old photo type of tag, using distress ink pads. In honey and vintage photo. The flowers are just some I had on hand, with a stick pin, and an old button gem at the top. What a beautiful image and beautiful tag you've created! Thanks for your inspiration Mary!